The London Cycle Network was planned by the London Cycling Campaign shortly after it was formed, in 1979, and approved by Ken Livingstone when he became leader of the Greater London Council in 1981. This led to some minor improvements in London’s cycle facilities, like some contra-flow lanes on one-way streets. No ‘network’ of cycling infrastructure was planned or built. Most of the money was spent on signposting routes on backstreets. Because so little infrastructure was built, the LCN attracted few users and cyclists came to see it as a time-wasting attempt to make more space for motorists on busy roads. Looking back, I’m grateful for some small improvements, as a starving man is grateful for bread crumbs. But I’m still as angry about it being called a ‘London Network’ as I would be about 3 bread crumbs being called a Three Course Meal. The below video may have a nostalgic charm for those who biked London in the 1970s and 1980s, as I did. Design 1981-1986. Ken Livingstone became leader of the Greater London Council (GLC) in 1981. He set up a cycle planning unit in the GLC and allocated 1% of the transport budget (£2m/year) to cycling. Its work ended when the GLC was abolished in 1986. Implementation 1981-2008. The GLC’s work on implementing the London Cycle Network was transferred to the London Boroughs after 1986. Some, like Camden, were fairly active. Others, like Westminster, developed a hatred for cyclists. In 2001 LCN Plus (LCN+) replaced the earlier London Cycle Network project with the aim to producing a ‘higher quality’ network to link strategic centres. Since its length was reduced from 3000 to 900 km it should have been called LCN Minus. Afterlife 2008-2018. Active promotion of the London Cycle Network drew to a close with the election of Boris Johnson in 2008. Focus shifted to the two phases of the Cycle Superhighway programme, with the LCN winning an afterlife in the form of the Quietways programme. The length was much less than LCN+ so it could well be called ‘LCN Minus Minus’. See LAA Review of Quietway 1. John Grimshaw, in a book on the National Cycle Network (Sustrans, 2000) wrote, in a fit of insanity, that the 3000 km of the London Cycle Network ‘provide direct access to all major centres of employment, education and leisure in addition to all of London’s railway stations’ (p.64). As a marketing stunt for Sustrans (which Grimshaw founded) he might as well have put up another signpost and added 54.6 million kilometers so that cyclists knew the way to Mars. As Rachel Aldred says in the below video: ‘historically cycling policy has focussed on encouraging people to cycle, rather than changing a road environment that’s frequently scary and intimidating’. The first ‘Blue Paint’ phase of Boris Johnson’s Cycle Superhighway programme, launched after his election in 2008, looked more like a network but the quality was indifferent (see History of cycle infrastructure planning in London). The second phase, which began to open in 2016, was of higher quality and some sections, like the Embankment section of CS3, are a joy to ride. By London standards, it can be described as a ‘gold standard cycleway’. By Dutch and Danish cycling standards it would not get a bronze medal (because it is bi-directional). The Transport for London TfL website has legacy references to LCN but, thankfully, there is no more talk of completing the atrocity. In the interests of sanitization and repentence the TfL website needs a new page, (1) explaining why the name London Cycle Network is being dropped (2) explaining what was wrong with it (3) explaining what will take its place. Also, the LCN signage and road markings, implying the existence of cycling facilities that do not exist, should be removed. Also, TfL should stop using LCN data in its Journey Planner. Useless cycle maps have no use. Routing advice should take account of the safety data mapped by Rachel Aldred and I support her call for a map of the London Cycleable Network. The LCN belongs with the living dead and the most recent LCN map I could find was published in 2002. The key (left corner of above map) classifies Cycle Routes, Part-Completed Routes and Proposed Routes. The preposterous deceitfulness of this data is revealed by looking at any part of London you know. See for example, my the video clip of cycling on London Bridge at the top of this blog post. It was classified as ‘Part Completed’ in 2002 and the clip (from 2:60 to 4:26) of the LCN17 cycle route on the Isle of Dogs (shown on the above map in blue, as a completed route). The Sustrans N1 Route and the TfL Olympic Cycle Route are just as bad. Red eyes is what they give you. ‘Cycleways’ are facilities in the sense of ‘physical infrastructure designed for cyclists’. Most elements of the LCN were signposted routes on backstreets for travel between town centres. Signposting a backstreet route from Barking to Ilford does no more for cyclists than signposting a route to Mars does for astronauts. The term ‘network’ refers to an interconnected system, Cyclists want safe routes which follow their desire lines from origins to destinations. The LCN provided little physical infrastructure. Mainly, it was a paint job which road markings and signs on posts to try and make cyclists feel cared for. The term ‘plan’ means that there is an intention, and funding, to create a connected network of facilities. This would give London a sustainable mass transit system. So-called London Cycle Network had a few kilometres of useful cycle infrastructure. They and should be used in the London Cycleway Network Plan. As well as providing a segregated cycle network, all London streets (except major highways) should be cyclist-friendly. 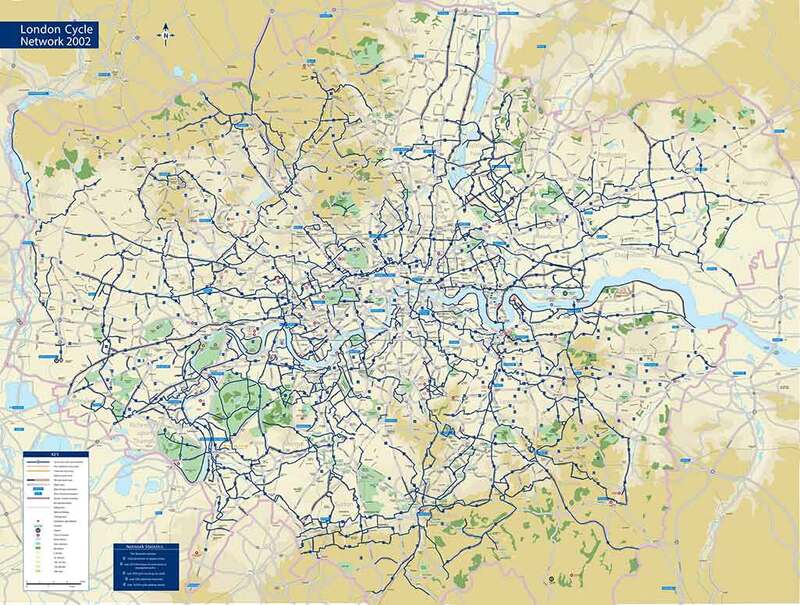 LONDON CYCLE NETWORK or LONDON CYCLEWAY NETWORK PLAN?